ubsidizing every citizen's personal payments for private health insurance and private school tuition, which he freely chooses to make for himself and his family, would be significantly less of a burden on us taxpayers than giving government any power to forcibly herd all citizens into public health care and public education impersonally run by uncaring, careless, mindless bureaucrats(birm). This system of distributing to citizens means-adjusted vouchers that may be spent only on these specific services would replace all federal and state health- and education-related expenditures. The behemoths known as Medicare, Medicaid, and Public Government Schools — after decades and decades of wrecking havoc on our lives and minds, eating up our budgets, and leaving behind street after scorched street flowing in rivers and rivers of blood-red ink — would each finally be slain. 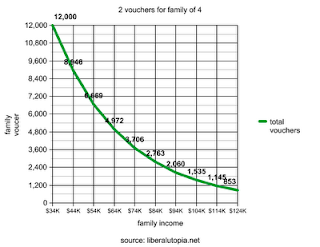 For a family of four with two children attending private school, the total amount of their two education vouchers decreases with their income as shown in the graph below. Health care vouchers are available to every family member. The maximum amount of each voucher depends on the citizen's age and any long-term health issues. 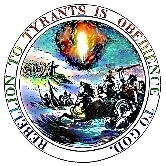 Now the only thing we need to Raise Awareness™ enough for people to demand this new system over every same old failed, freedom-killing big government øne(birm) is the bumper sticker.